Poor bladder control can wreak havoc on happiness and well-being. Don't let your bladder control you and your life. Bladder Rescue has seven ingredients that can help support your bladder and urinary health. This formula was specifically created to support healthy bladder function and control, working to promote overall health and well-being. Bladder control issues become more common as you age, so it is important to provide proper support to bladder health. Bladder Rescue uses a combination of pumpkin seed extract and soy isoflavones to help support a healthy and strong bladder. Pumpkin seeds have been used for hundreds of years in traditional medicine to help support bladder health. In addition, the formula contains cranberry extract. Cranberries and cranberry juice are commonly associated with urinary tract health. 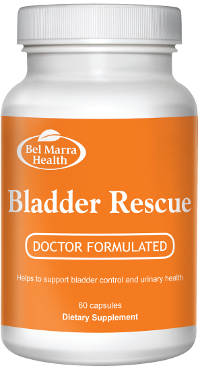 Bladder Rescue provides the support for bladder health and control that you deserve. DIRECTIONS Adult take two capsules daily. One in the morning and one at night. WARNINGS This product contains soy, which can influence estrogen levels. If you have estrogen dependent conditions consult a health care practitioner before use. Consult your health care practitioner prior if you have blood pressure issues. I am letting you know that these are amazing products. I’m delighted with Bladder Rescue and 20/20 Vision. Thank you so very, very much. I have previously ordered Bladder Rescue, and I love it!! I could not imagine being without it. It is now part of my daily routine. I am praying that I love the Hearing Rescue I just received as much Bladder Rescue. At 82 years I am well pleased with Bladder Rescue. I have been taking Bladder Rescue for 3 months and would not trade it for anything. Thank you so much. Was I ever glad to hear about Bladder Rescue in the mail Your Bladder Rescue has made a new woman of me – and I am 80 years of age. I previously wrote you about the difference Bladder Rescue makes in my life, and wanted to write you again. Thank you. Just a few words to let you know that I have been very satisfied with products I get from Bel Marra. I’m especially thrilled with the way Bladder Rescue has helped me.